This June, I was lucky enough to get invited to an advance showing of the new Zeiss Victory SF binocular at Zeiss's production facility in Wexler, Germany. This is their new premium binocular, designed especially with birders in mind. What an eye-opening experience! I got to watch highly skilled craftsmen meticulously creating the binoculars, one by one. They assembled the parts with infinite attention, checking and re-checking at each step to make sure the quality was impeccable, making sure the experience of using the binocular would be completely satisfying. 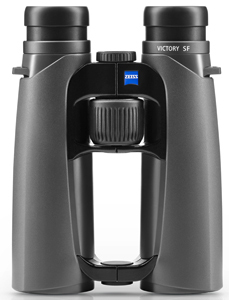 As I write this report, the Victory SF is not shipping yet, but Zeiss expects to begin deliveries in January, 2015. When I first picked up a Victory SF, I was struck by how well it balanced in my hands. Zeiss has a new prism system that shifts the center of balance towards the eyepieces. For the first time when using a full-sized binocular, I didn't have to work my wrists at all to align it with my eyes. I knew instantly that this was the best-balanced full-sized binocular I had ever held. Although it's full sized, it's lightweight. Lighter than its high-end competitors. And its great balance makes it seem like it weighs even less. I could hold it a long time on a bird without getting tired. I could even hold it comfortably with one hand. And I'm old! Look where that focus knob is! When you're holding the SF, the focus knob is already right under your index finger. You don't have to stretch your finger out to the side to reach it. This makes focusing much more natural, instinctive, and comfortable. 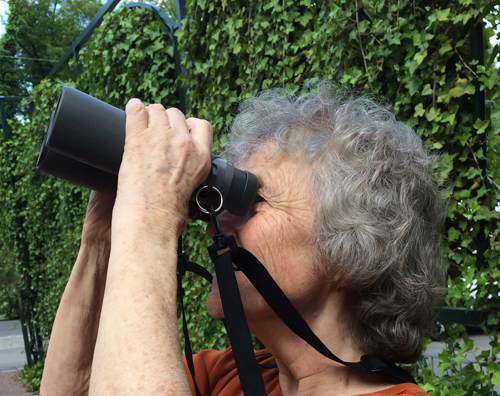 It's a big deal in a birding binocular, because you're re-focusing all the time. The knob itself is designed not to slip under your finger, even when it's wet. And it focuses fast, so you can quickly go from looking at the soaring hawk to the sparrow on the ground. Close focus is about 5 feet. Great for butterflies or a hummingbird up close. The triple-link bridge makes for an extraordinarily strong construction. It's taking the open-bridge design a step further. It allows for an easy one-handed grip around either barrel, but the two barrels are connected at three points. I especially love the way the graceful curve of the barrels fits the hollow of my hands. It's both beautiful and practical at the same time. A happy marriage between form and function. The 10-power SF has the same extraordinarily long eye relief as the 8-power — 18mm. This allows everyone, whether they wear glasses or not, to enjoy the full field of view, even in the 10-power model. Usually, if you're a glasses wearer, you can't choose the 10-power unless you're willing to give up part of the view. Now you can choose whichever power you prefer, whether or not you wear glasses. Both the 10x42 and the 8x42 Zeiss Victory SFs have a generous, wide field of view. It's something you notice the moment you look through the SF. I personally feel that a wide field of view is one of the most important components of a good binocular experience. With a wide field of view, all I see is the scene, and I feel immersed in it. With a binocular that has a narrow field of view, I would be conscious of the dark edge of the scene, as if I were looking through a tube. But looking through the Zeiss Victory SF, I was magically transported up close to the bird, as if I were actually looking at it from a fraction of the distance. It was great! The 8x42 model provides an astounding 444-feet field of view at 1000 yards. The chart below compares the field of view to other 8x42 premium binoculars (or, for Swarovski, 8.5x42). The 10x42 Victory SF gives you a 360-foot field of view at 1000 yards. 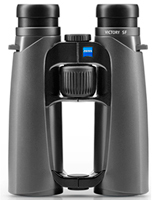 The chart below compares the field of view to other 10x42 premium binoculars. 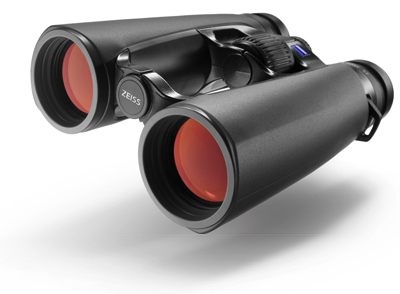 It looks like Zeiss has gone all-out to capture the top end of the birding optics market. The Victory SF is not just a tweak of some previous model, but a brand new design. The optics geniuses at Zeiss that I talked to told me they wanted to create the best birding and wildlife-observing binocular in the world. When you're using the SF, you see a bird, and as soon as you raise the binoculars to your eyes, you're centered on that bird, with your index finger ready on the focus knob. Also, sometimes you want to study a bird for a long time. Watching for the moment when a vital field mark is revealed. Trying to note details of the bird's behavior. Perfect balance means you can look longer without getting tired. Look again at the picture of the SF. Note how the beautiful curve of the barrels fit the palm of the hand. Congratulations to Zeiss. I don't know if there is such a thing as a perfect binocular, but Zeiss has certainly leapfrogged in that direction. When these start shipping, we expect supplies to be limited. If you order now, we will of course not actually charge your credit card until we ship you your binocular. You can cancel your order any time before we ship. So all you're doing is getting in line. Click on the picture of the binocular to go to the order page.